I spend a lot of time out on public land. Littering is an issue in even some of the most remote places I have visited. Aside from regular garbage, some sportsmen/women are also huge litterbugs when it comes to targets, shells, casings, packaging etc. 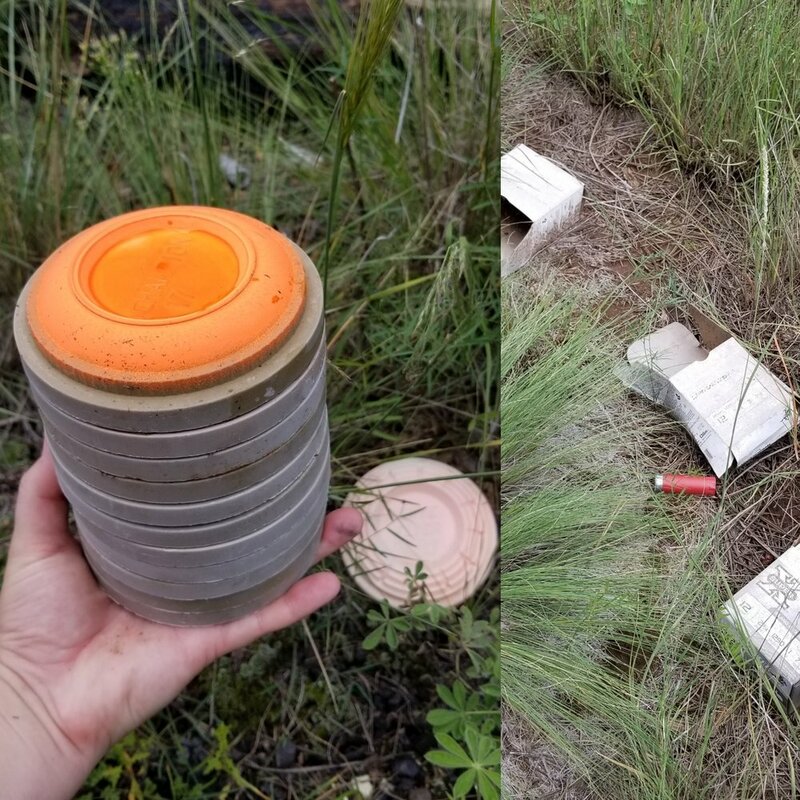 Lately I have witnessed a lot of this shotgun related trash in areas I frequent for exercising my dog and myself, so I wanted to look into how different components of sporting clays and shotgun shells break down. We’ve come a long way from pulverized limestone held together with petroleum/pitch/coal- tar, standard shooting clays but they can still be found, and I bet still used in many parts of the world. A couple of our favorite clay producing brands are claiming to use more environmentally friendly materials in some of their products. Let’s start with Champion Targets. Getting rid of the petroleum pitch binder to hold the clay together, they say they use a naturally occurring forestry product(1) to bind the limestone together and form it into a clay. I am assuming the forestry product to be something like lignin, a tree sugar and or biproduct of the wood pulping industry to be the binder in these. I am assuming based on my experience in the agriculture industry using lignin products to control dust on roads as it is a binder and because I couldn’t find an actual ingredient list for these targets. Limestone in contrast, is basic/alkaline on the acidity scale. Champion’s website claims that their targets will not acidify the soil which if you don’t fully understand the acidity scale, this comment is misleading and should be expanded upon by their marketing group in my opinion. Further digging into this I found a forum on shotgunworld.com where Champion Target’s General Manager Tim Emmenegger responded to this acidity questing saying “Their test data shows the target breaks down to a pH of 7.8” (2). A neutral pH is 7 but one must consider the pH of the soil to begin with and then the eventual load of target shards built up in a certain area. Another highly popular target is the WhiteFlyer. They have a biodegradable clay target and state that it will biodegrade 95% in 2 years. They also caution that accumulation of these spent targets will cause a change in soil pH. (3) So one company says they will, one company says they won’t. Let’s dig into the difference. Under WhiteFlyer’s facts page, the first question asks what the target is comprised of. I copy/pasted the answer. “The target is comprised of several ingredients: the two major are limestone and sulfur. Over time, the limestone will condition the soil and the sulfur is broken down by microbes in the soil into a sulfate. This sulfate is a plant nutrient and is essential for many plant’s growth. The biodegradation of sulfur is well documented in literature as extremely large volumes of sulfur are spread on US soils yearly as a plant nutrient and soil conditioner. The other components in the target are all minor in concentration and aid in the degradation of the target such as lignin, a sugar found in trees. As stated on the box, if you throw a large number of targets in a concentrated area we recommend spreading limestone in the area to prevent the Ph from dropping due to the high concentration of sulfate or removing the targets from the area.”(4) This option seems like a much better purchase to me and mostly because I am better informed. A company in Bulgaria called Eco Sports Gear is in the developing stages of a target made of plant and mineral compounds in a trade secret formula that will dissolve in a matter of weeks. (5) You can contact them on their website. I couldn’t find a way to purchase these. Let’s talk about our shotgun shells. Try not to use lead shot near water. Lead is detrimental to wildlife, aquatic life and eventually us as it can get into our groundwater. The plastic shells. Plastic doesn’t decompose so pick it up. And pick up the shells that were there when you arrived and recycle them. Metal parts will degrade eventually but this depends on the environment and soil composition. Soil microbes don’t do well in areas with high concentration of copper. Pick it up. And finally, shotgun wads. Now I know these end up far away from you and sometimes you can’t ever find them. If you can though, please pick these up as well. Roughly 10 to 15 billion wads are produced annually. According to NOAA, plastic wads are one of the most common marine debris found during beach clean-up activities. (6) Researchers at the Virginia Institute of Marine science are working of making a biodegradable wad that would degrade in 1 to 2 months. (6) And companies are coming on board with this concept. If you reload, consider purchasing wads from GreenOps Ammo. Visit their site at www.greenopsammo.com. I don’t go to the outdoors to be a free trash pick-up girl for every irresponsible sports person. I’d like to go out and enjoy nature without seeing anyone’s trash. I think it is wonderful that manufacturers are starting to take a stand and realize the importance and impact our sport has on our environment. I just wish everyone cared as much as they should. It takes 5 minutes to clean up after yourself.